I love to eat fresh pineapple. It is sweet, juicy, healthy and delicious. When Maheshwari of Beyond The Usual chose this tropical fruit for this month’s AFAM I was overjoyed. With it came the confusion as what to cook. I didn’t want to cook any sweet dish of pineapple as most of my blogger buddies have cooked almost all the recipes available. So here I am with my recipe of Pineapple Menaskai which is my all time favourite dish. Menaskai is a sweet, tangy and spicy side dish which is usually served during any family functions and weddings in my native. 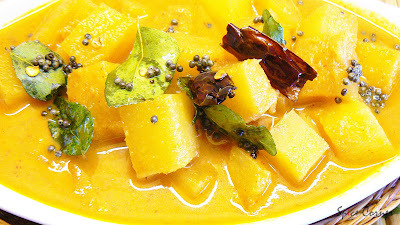 The main 3 ingredients in menaskai are coconut, red dry chillies and jaggery and depending on seasonal availability, bitter gourd or mango or pineapple are used to make it. Peel the outer skin of pineapple and dice them into 1 cm squares. Cook them with 1½ cups of water, tamarind, jaggery and salt to taste. Cook pineapple till it becomes soft in medium flame. In a mean while, take a pan and dry roast sesame till it turns golden and keep it aside. Take a tbsp of oil and sauté broken red chilli and grated coconut till it turns golden. Grind this coconut, red chilli and sesame to smooth paste adding little water. Add this ground paste to cooked pineapple and mix well. Cook this in a medium flame till the gravy starts to boil. Reduce the flame and cook for further 4-5 minutes till gravy starts thickening. Season it with mustard, curry leaves and broken red chillies. 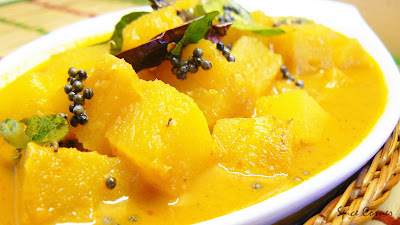 You can substitute pineapple with bitter gourd or medium ripe mangoes also. If you are making bitter gourd menaskai, increase the amount of tamarind to lime sized balls to tamper its bitterness. Adjust the sweetness and spiciness according to your taste. First called “anana”, a Carribean word for “excellent fruit”, the name “pineapple” came from European explorers who thought the fruit looked like a pinecone with flesh like an apple. The Spanish explorers thought pineapples looked like pinecones, so they called them "Pina." The English added "apple" to associate it with juicy delectable fruits. Of all the New World discoveries of Columbus, pineapples were the fruits that caused the biggest stir back home. In a Caribbean rite of manhood, barefoot youths ran through pineapple plantings and were expected to bear the resulting wounds without protest. Caribbean Indians placed pineapples or pineapple crowns outside the entrances of their homes to symbolize friendship and hospitality. Nice, Lovely and beautiful entry!! My mouth is drooling already.Wish You Happy new Year. Manaskai looks yummy,I will make it some times.Whole weekend ,I didn't open my blog roll,thought I missed so many! !Party was great,I also put the blog header! !Thank you Sia,looks great darling.I didn't cook much for Wednesday,will put up some photos. Great info to read about Pineapple.Are you going back to work this work or what?If not,give me some ideas to unclog my stuck comments! ;D Giving you something to do,don't hate me!!! 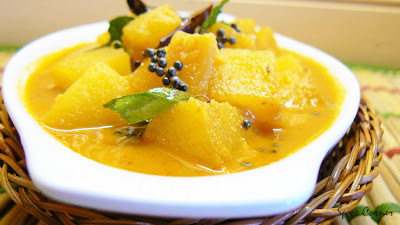 This is completely new recipe to me....Wonderful information on Pineapple.. I sent you this in your previous post, but never mind I will send this again, Ugadi habbada hardhika shubhashayagalu! Happy ugadi to u guys too! The pineapple menaskai looks yummy! Never had this before. I've had the bell pepper menaskai and loved it! so had good time @b'day bash? did tushar n trisha enjoyed their party n gifts? glad u liked the header akka. will try to add that quote also. hi there. i am fine sweetie. not much of festival food. just cooked authentic mangalorean food and made dates payasam for ugadi. K is on leave. so having good time together. ugadi habbada haardika shubashayagalu. habba heege nadita ide? gammatta? thank u dear. how is festival going on? hope u guys r having good time. hey I think you missed the b'day pics in my blog I posted. Did you see them? Happy Ugadi to you! 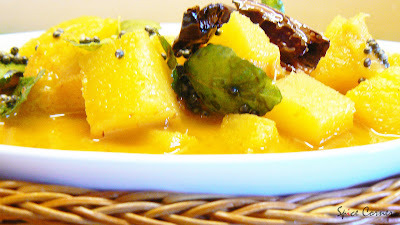 Pineapple recipe is new...looks delightful! Got your message on IM...hope you're having a blast at home, my dear! wow, i'm learning so so many new dishes from various regions thanks to blogging. This looks so good, Sia, keep such great ones coming. I guess canned pineapple won't do jusice to this one, right? 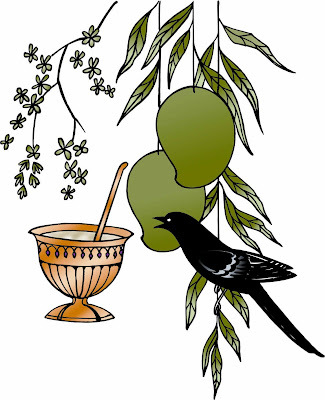 Happy Ugadi to you! Wonderful recipe. Never had or heard before. Sounds very delicious. Happy Ugadi to you and your family sia. This is a new dish for me and I love that name "Menaskai"
thanks for visitng my blog!! its such a delight to see u'r beautiful pictures!!! happy ugadi to u as well!!! hope u r having gd time sweetie. festival in full swing? thanks dear:) do give it a try n i am sure u will like it:) happy ugadi to u too. menaskai means chilli+coconut in kannada. he he, funny name isn't it? it tastes really good. have u tried this before? 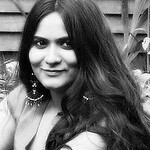 Hi Supriya, wow, this is very fancy vegetarian fare! With colours and flavours like these, I don't see why anyone needs meat! :) Thanks for sharing! It looks quite easy, too! what a lovely dish. like our keralite pachadi, but with sesame. Yummy...Nice recipe for the pineapple fest! Though I am from Mlore, never had this one! I have missed out on a whole lot of things :(.. but not any more. I can cook from your blog! Looks like a distant cousin to 'avanasa sasam' made my mom, but hers was a uncooked version. Nice recipe Sups, never thought that pineapple could be used in a savoury dish. Must be giving khatta meetha taste, n lovely pineapple flavour.Will surely try this. 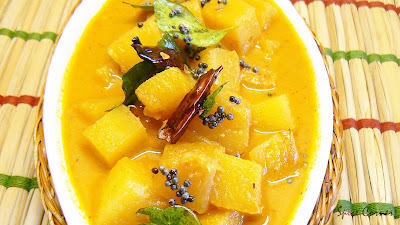 Happy Ugandi!I like curries with pineapple,I can imagine the taste with ur ingredients,and ur picture makes my mouth watering!! roasted sesame gives it wonderful aroma and taste. do try this sometime bee. its quite easy to make. avanasa sasam? i guess we call it pineapple sasame. u dont need to cook pineapple there, just add coconut+mustard paste to it and serve it chill. thank u and happy ugadi to u too. we usually have this for most of the functions back in my native. was it the same recipe or someother recipe of pineapple? As always very nice entry.We call this kairasa/Amti. Sups Happy Ugadi to you too dear girl!have a joyful,healthy and prosperous year to you and your family! aww... tumba dhanyavadagalu. nimma habba heege naditu? hey what does this photo mean?